Each Engine has two Directors with each Director containing two Back-End Fibre Channel I/O Modules (Labeled MOD0 & MOD1). These modules (also known as DA’s – Disk Adapters) provide Fibre Channel Connectivity to the drives. 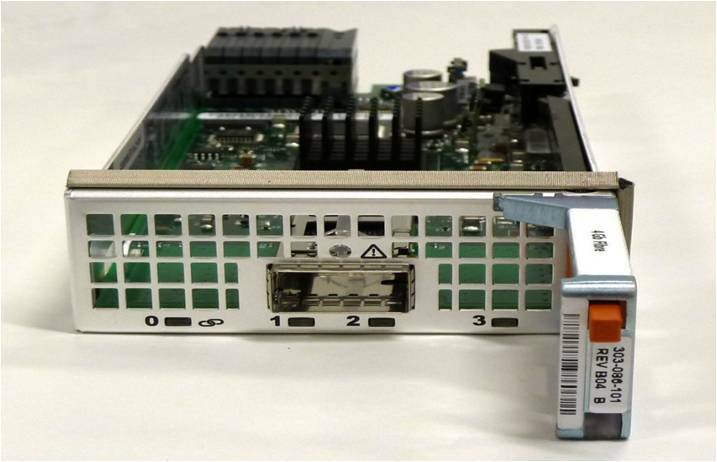 As you can see from the image below there is just a single physical port on the Back-end IO Module, this single port is a Quad SFP port (QSFP). The connecting cable has a single copper QSFP transceiver connector consisting of 4 Fibre channel cables aggregated into one Single QSFP port. 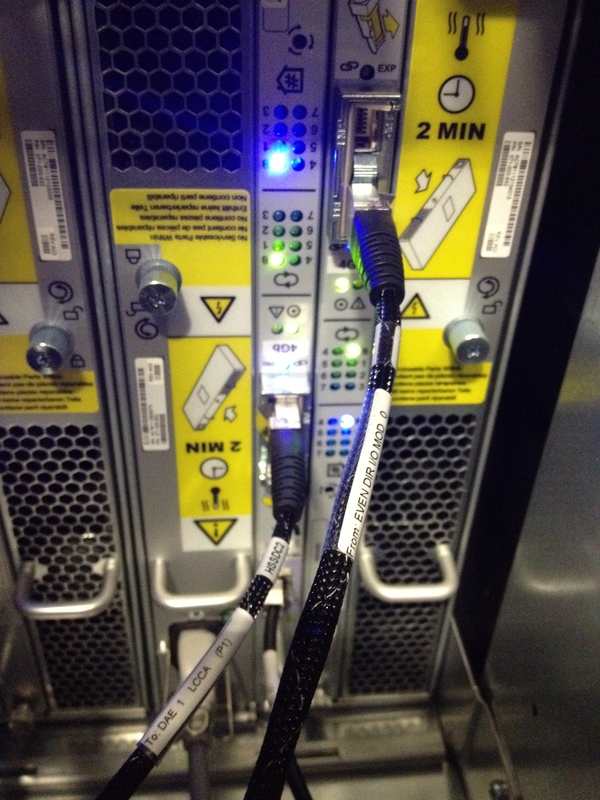 While at the Drive Bay side the 4 Fibre channel cables branch out as individual connections to the link control cards (LCC) as we will see shortly. Each DAE contains two LCC cards (LCCA & LCCB). The Engine diagram below provides the Port layout on the Engine and as you can see the lower director is the odd director and the upper director is the even director. 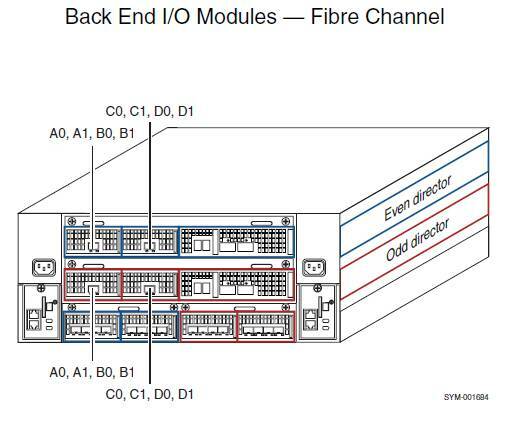 On both directors there are two Back-end IO modules (MOD0 & MOD1) per director, the Back End IO Module MOD0 has connections A0,A1,B0,B1 and MOD1 has connections C0,C1,D0,D1. Here is an example of a Standard VMAX Storage Bay Configuration fully populated (8 Engines) with 10 storage BAYS as if viewed from the Front of the VMAX. In this fully populated configuration you have four direct connect storage bays (Bay 1’s) and six daisy chained Storage Bays (2’s & 3’s). Each octant represents connectivity from a Single Engine (2 x Directors). We can see from the labeling on the image below of Engine4 that the Even Director (DIR8) connects to LCCB and the Odd Director (DIR7) connects to LCCA. MOD0 on both the even and odd directors connect to DAE’s 1,5,2,6 with MOD1 on both directors connecting to DAE’s 3,7,4,8. 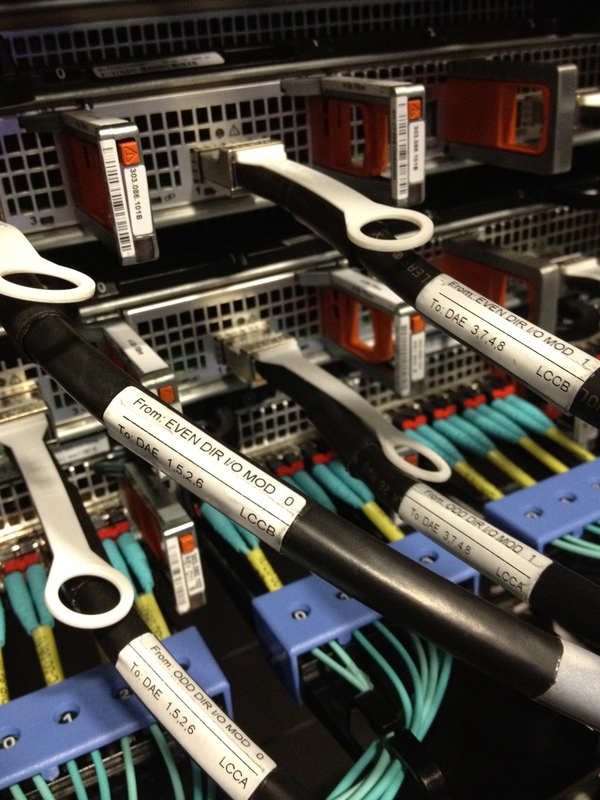 This completes the example of the direct attach Back-end cabling for Engine 4. The same rules apply as you add more engines. As a result of this design the back-end cabling provides dual access across directors to each drive eliminating any single point of failure (8 Redundant Loops). Note: Please reference EMC Documentation for more detailed information specific to your configuration. Depending on Engine counts and Direct/Daisy configurations your cabling may expand differently. I’m wondering how SAS is being realized in a Vmax. Are there SAS BE disk direcors available or is FC being converted to SAS in the LCC or DAE? Can you post a similar post on the Front End Directors ? With pictorials representation ? 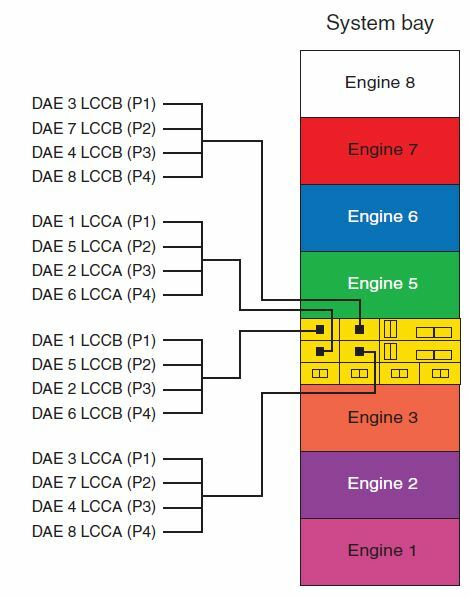 That will help in understanding the numbering of the FA ports per engine. This Documents & informations are very useful. Can u share some more DAE connectivity breif…. Really Awesome, Really thanks for sharing this information. Kindly allow me to clear my doubts regarding this, If Engine 4 goes completely offline then will other engine get access to Engine 4 associated DAE’s. If yes then How they will get it. Good one Dave. Nicely explained. Do you have a similar article posted for Vmax 3 architecture?